This knightly order is known by various names, including the Livonian Knights, the Order of the Brethren, the Christ Knights, the Sword Brethren, the Militia of Christ of Livonia, or the Order of the Knights of the Sword. One reason is because they were formed and operated in what are now the Baltic States, amid fractured tribes of peoples who did not have writing of their own, and as part of the German-led Northern Crusade to Christianise (and profit from) the region in a period of little administrative permanence in the region. Officially, they began as the Order of the Knights of the Sword, and from 1237 were known as the Livonian Knights. In 1201, Bishop Albert from Bremen in Germany landed in the Baltics with his followers at the mouth of the River Väina,and founded the town of Riga (in modern Latvia). The following year he founded the Livonian Order of Knights for the purposes of conquest and Christianisation in the Baltics. Their headquarters was at Fellin (now Viljandi in Estonia). 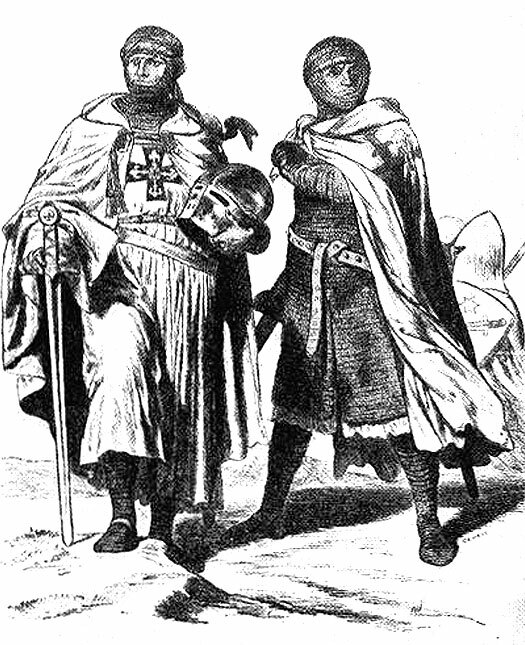 In 1237 the Livonian Knights joined the Teutonic Knights as an autonomous branch. While the Danes were busy taking over and securing all of North Estonia by force, The rest of the country was undergoing the same process from the south. What is now Estonia and Latvia quickly came to be governed by German prince-bishops in Courland, Dorpat, Ösel Wiek, and Riga, while the Livonian Knights conquered the rest of Latvia and central Estonia. The captured territory between Danish Estonia and Lithuania became known as Livonia. Crusader-bishop in the Baltics & first grand master of the Knights. The bishop of Riga assumes the style 'prince of Livonia', and makes Livonia part of the Holy Roman empire, although this is not formalised until 1 December 1225. Part of the bishop's territories are given as a fief to his standing army, the Livonian Knights. The Estonian counties fight various battles to regain lost land from invading forces, ending in their biggest victory at the River Ümera. It is around this time that a particular Estonian chief emerges (one of the very few to be named at any period). Lembitu makes an attempt to unite the various Finnic tribes in Estonia to fight against the Livonian Order and German crusaders. He raises an army which numbers several thousands and raids south and east, reaching Pskov in the Novgorod republic, below Lake Peipsi. The small principality of Koknese on the right bank of the River Daugava is taken over by the Order of the Knights of the Sword, as they are known at this time. Of Kassel-Naumberg. Killed by a Knight. Of Kassel-Naumberg. Killed at Schaulen. A short-lived Lat principality which is subject to Polotsk and which is situated in Gersik, or Gersike, on the right bank of the Daugava around 150 kilometres south of Riga is conquered by the Order. Over the course of this period, North Estonia is slowly taken by force under Danish control. In 1220, following quarrels between the Danes and the Livonian Knights over the exact borders between their conquests, Denmark agrees to submit the southern Estonian provinces of Sackala and Ugaunia which are already under the control of the Order. Bishop Albert submits to Denmark the provinces of Harria, Vironia, and Jerwia. The Danes are temporarily eclipsed in North Estonia when the Order conquers all of their territory. The Order of the Knights of the Sword are decimated by the Samogitians and Semigallians (two peoples who are situated between the Lithuanians and the Lats in what is now southern Latvia) at the Battle of Schaulen (Saule or Šiauliai) in 1236. The following year, what remains of the Order joins the Teutonic Knights as an autonomous branch in Livonia, now known as the Livonian Order, or Livonian Knights. While being subject to the grand master of the Teutonic Knights, the Livonian Knights continue to operate on their own behalf. Now unable to hold onto North Estonia securely, the parishes of Harria and Vironia are returned to the Danes under the terms of the Treaty of Stensby in 1238, which is mediated by the Pope. However, the Knights keep Jerwia and also have control of Ösel-Wiek. Along with Bishop Hermann of Dorpat, the Teutonic Knights are defeated by Alexander Nevsky, prince of Novgorod, on 5 April at the Battle of the Ice on the shores of Lake Peipsi (Peipus). This halts the eastwards expansion of the Knights. However, the Livonian Knights record a success with the final conquest of the Couronians. Mindaugas is crowned king of Lithuania, and he transfers part of the Samogitian territories to the Livonian Knights as a means of ensuring peace. At the end of a two year truce, the eager Samogitians inflict a defeat on the Knights at the Battle of Skuodas. Their success encourages the Semigallians to rebel. The Livonian Knights, along with the Teutonic Knights, are abandoned by their Estonian and Couronian vassals and defeated again, this time severely, at the Battle of Durbe in Livonia by the Samogitians. As a result, numerous rebellions break out against the Teutonic Knights all across the Baltics, including military expeditions by the Lithuanians and a general uprising across Prussia known as the Great Prussian Uprising. The bishop of Courland leaves and only re-enters the territory in 1290. The Prussians win several battles against the hard-pressed Knights, with Duke Skomantas of the Yotvingians attacking the stronghold of Chełmno in 1263, and by 1264 the situation is critical. Reinforcements arrive from Germany and the Order launches an attack against the rebels, with final defeat of the Prussians coming in 1274. The situation on Livonia's southern border has deteriorated greatly over the past three years, and doesn't improve when the king of the Lithuanians is murdered by his nephew. With both German crusaders and Lithuanians from the Baltics impinging on the territories of the various Rus principalities that are still vassals of the Golden Horde, Khan Mongke Temur sends troops to Novgorod to eject the Livonian Knights. Alternatively Wilken or Willekin von Endorp. Alternatively Konrad von Hattstein or von Herzogenstein. Alternatively Heinrich II von Dumpshagen. The principality of Polotsk is secured by the brother of Grand Duke Gediminas of Lithuania. Successive Lithuanian rulers help in fending off attacks by the Livonian Knights. Alternatively Gerhard II or Conrad von Jocke or Conrad von Jorke. Alternatively Konrad Ketelhoed, Johannes Ungenade. The St George's Day Uprising sees a large-scale Estonian revolt beaten by the Livonian Knights, using a mixture of treachery and battle. However, the Knights are unable to prevent some disasters, such as the loss of Pöide Castle on Ösel-Wiek, and the probable massacre of its entire garrison. The Danish king sells North Estonia to the Livonian Knights for ten thousand marks. This gives the Knights' superiors, the Teutonic Knights, control over the bishopric of Reval. All of Estonia is now ruled by a German nobility class. The official transfer of power takes place on 1 November 1346. Bishop Dietrich of Dorpat hates the Livonian Knights with some intensity, so much so that he forms a coalition against the Knights with Lithuania, Mecklenburg and the notorious Victual Brothers who are Baltic pirates. The Knights invade the bishopric but achieve no success. In the end their lack of results removes from them the right to demand military service from the Livonian bishops. The Battle of Tannenberg on 15 July witnesses Polish and Lithuanian forces under Polish leadership halt the eastward expansion of the Teutonic Knights. After this defeat, the Livonian Order begins to weaken and disintegrate. Alternatively Zisse, or Cisse von dem Rutenberg. Grand Prince Zygmunt of Lithuania crushes the opposition forces of Swidrygiello and his ally, the Livonian Knights. This proves to be the last invasion into Lithuania to be carried out by the Knights. As the Orthodox Rus border Livonia to the east, the Knights can claim to be holding an outpost of Catholic Europe, and while they are more than interested in trade with the Rus, the expansion of Moscow up to Livonia's borders at this time complicates matters. War between Moscow and the Knights breaks out in 1501. Livonians, uniting their forces under the leadership of the Knights, defeat Moscow's army near Lake Smolensk in 1502, and a truce is concluded the following year which lasts until 1558. The Russians are prevented from expanding westwards to the Baltic coast. The monastic state of the Teutonic Knights is secularised during the Protestant Reformation and replaced with a duchy in East Prussia, robbing the Livonian Order of its support and supreme leadership. Became first duke of Courland. Following Russian provocation and the conquest of Dorpat, the Livonian Wars erupt in the Baltic States between 1558-1583. The Livonian Knights and the archbishop of Riga seek help from Sigismund II of Poland-Lithuania, pawning five Order castles and two archbishopric castles together with their surrounding territory to help procure it. However, the army of the Livonian Knights is completely destroyed by the Russians at the Battle of Ergeme in 1560, and a year later, on 29 November, the master of the Order, Gotthard Kettler, acknowledges the supreme power of Sigismund II over all areas regarding the Order, including its territories, formally dissolving the Livonian Knights. 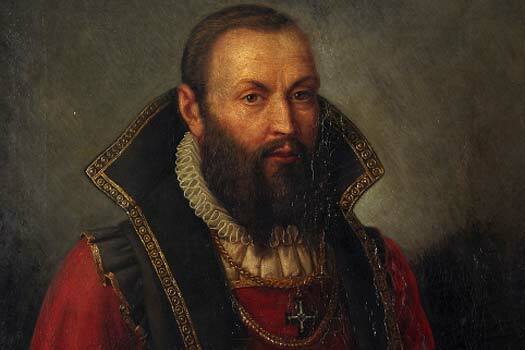 Gotthard Kettler becomes the first duke of Courland in 1562 under Polish suzerainty, and the Polish governor of Livonia itself. As individuals the former knights retain their vast estates in the Baltics. North Estonia surrenders voluntarily to the Swedes. Southern Estonia remains part of Livonia and this is drawn into the Lithuanian state which, in 1569, is effectively merged with Poland to form a united monarchy.